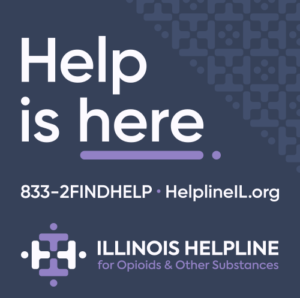 The Illinois Department of Human Services is charged with designing, coordinating and funding a comprehensive and coordinated community-based and culturally and gender-appropriate array of services throughout the state for the prevention, intervention, treatment and rehabilitation of alcohol and other related disorders. This system addresses the needs of at-risk or individuals with Substance Use Disorder and their families. As the single state authority for Substance Use Disorder (SUD) in Illinois, the Department delegates these responsibilities to the Division of Substance Use Prevention and Recovery (SUPR). The integrated SUD service delivery system within DHS is coordinated by SUPR. These offices are primarily responsible for providing prevention, intervention and treatment services related to alcohol, tobacco and other drugs to citizens of Illinois. Such services are supported through a combination of state and federal funds and with the exception of prevention services, SUPR is responsible for all other services. As a community partner, the Department's Advisory Council on Substance Use Disorders supports the Department and is instrumental in the planning of a comprehensive community-based system of SUD services. The mission of the Division of Substance Use Prevention and Recovery is to provide a system of care along the continuum of prevention, intervention, treatment and recovery support where individuals with SUD, those in recovery and those at risk are valued and treated with dignity and where stigma, accompanying attitudes, discrimination, and other barriers to recovery are eliminated. SUPR consists of four Bureaus designed to reflect our mission and planning goals and objectives. Primary responsibilities are to develop, maintain, monitor and evaluate a statewide SUD system of care. The treatment delivery system is designed to provide screening, assessment, customer-treatment matching, referral, intervention, treatment and continuing care services for people with SUDs. These services are provided by numerous community-based SUD treatment organizations contracted by SUPR according to the needs of various communities and populations. A portion of the funding of services is from Substance Abuse and Mental Health Services Administration/Center for Substance Abuse Treatment (SAMHSA/CSAT).